Oak Hills features Tyler’s first concept grocery store – aptly named FRESH by Brookshire's Grocery Company, opening Spring 2011. Oak Hills is home to The Ridge shopping center, currently under construction. The Ridge provides a unique urban shopping environment including stylish restaurants and specialized boutiques and services. The Promenade area of Oak Hills, showcases a variety of professional offices, retail stores and eateries. Tyler Independent School District has joined the area with plans to build the new middle school campus. 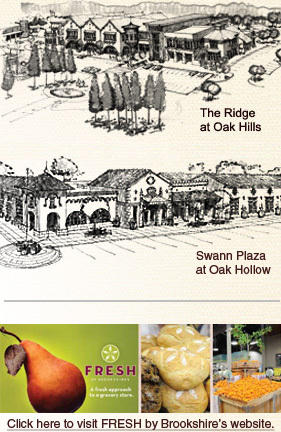 Oak Hollow retailers are just steps away from many of Tyler's finest homes. Swann Plaza will break ground Spring 2011, featuring the new Swann's Furniture Gallery. Luxury retail and restaurant sites align the lakes and walking trails of Oak Hollow. Sites are available in both Oak Hills and Oak Hollow. A variety of square footages are offered and can be built to suit any retailer's needs. Patron luxuries feature front door parking and a spacious outdoor park where friends can gather.